In the spring time, the local flocks of sheep are sheared of their winter coats. Soon after shearing, wool growers bring their fleeces to Tierra Wools to be sold. Before the wool is purchased it must be skirted. The wool skirting process is probably one of the dirtiest processes, but is the most important of all, as the quality of Tierra Wools yarns depend upon the quality of the wool. Wool skirters pick through every single fleece by hand, removing all contaminating elements such as tags (the area around the tail and bottom side of the fleece), bellies (the very short fiber right around the belly of the sheep), and environmental debris (twigs, burrs, etc). The raw wool is taken through a wash, rinse and spin process. The wool is put into nylon mesh bags, then pre-soaked to loosen grease and dirt. The bags are then put into water at 140 degrees to be washed. Biodegradable detergents are used to protect the delicate fibers of the wool as well as the environment. After 20 minutes or so the wool is rinsed, then put into a high speed extractor and nearly spun dry. The newly washed wool is then laid out on wire racks and air dried. 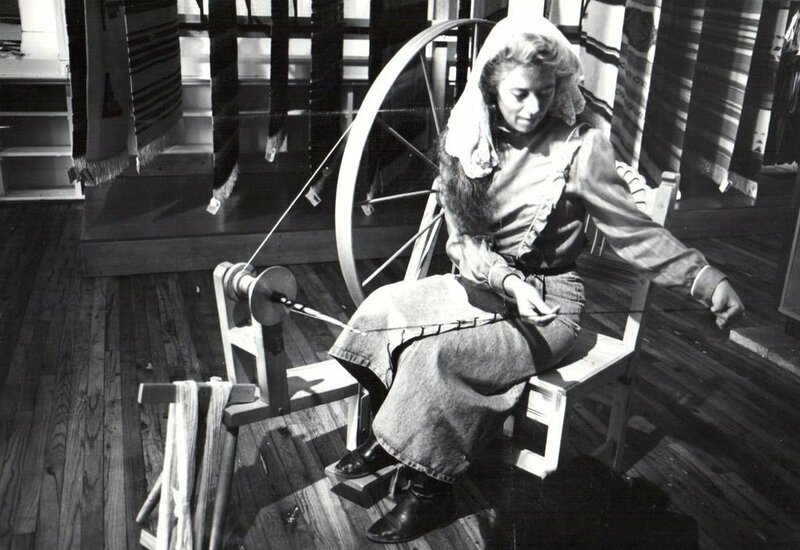 There are regular schedules for spinning of the wool, which is the process in which wool that has been carded (fibers straightened and separated) is attached to a large spinning wheel which has a foot peddle connected. The wheel spins forward through the action of the pedal. As the wool is held at arms length, the spinning wheel ‘twists’ the wool into yarn. Both commercial and natural dyeing are done at our shop. Tierra Wools yarns are hand-dyed in large pots, which are set over piñon wood fires. The un-dyed yarns are soaked in cold water overnight. Early the next morning, fires are built and the dye pots are filled with water and brought to boiling point. The color choices are mixed and added to each dye pot. The wet yarns are then put into the pots and boiled until all of the dye color has been exhausted and the water turns clear. The yarns are then laid out on an air-filtered rack to cool before they can be put back into the cold water to rinse and set colors. At the end of each dye day, there will be an incredible array of yarn colors hanging by skeins in row after row, where they will be left to dry completely in the warmth of the sun. The warp is the set of threads that run vertically when wound onto a loom. The weavers wind a warp on a board that is attached to the wall called a warping board. Thirty yards of warp is wound at a time and “choked” with scrap pieces of yarn approximately two yards apart, to avoid tangling. These ties, as well as a “cross” in the warp, keep the warp ends from tangling. When the warp is pulled off the warping board, it is wound into a chain in preparation for it to be wound onto the loom. Each thread of the warp is passed through the heddle and the reed of the loom and then pulled through and wound onto the drum of the loom, with one weaver holding the warp at tension and two other weavers turning the drum. At this point in the process, the warp threads are gathered into bunches and tied onto a rod at the front of the loom. Gaps in the warp between the bunches are filled in with strips of material filler – usually strips of textile scraps or rags. Once the gaps are closed and the warp is evenly spaced, the weaver is ready to begin creating a beautiful work of art. The weaver winds the different colors of yarn onto bobbins, which are then individually loaded into a shuttle as they are used. The weaver steps on one treadle of the loom. This causes the harness of the loom to pull down every-other heddle, which in turn pulls down every-other warp thread, creating an opening that the weaver can pass the loaded shuttle through. The weaver calculates the slack needed in the crossed yarn so that the weaving does not draw in at the edges, and creates an arc in the yarn with his or her fingers. Then, the weaver shifts his or her weight onto the opposing treadle, reversing the position of the warp threads and locking in the arc as the beater is pulled down to pack the yarn thread in. 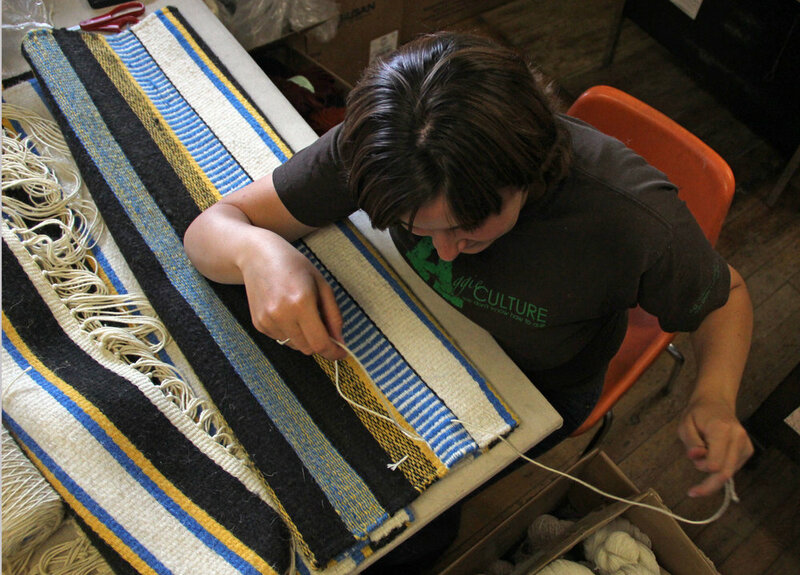 This procedure is repeated until the entire weaving is complete. 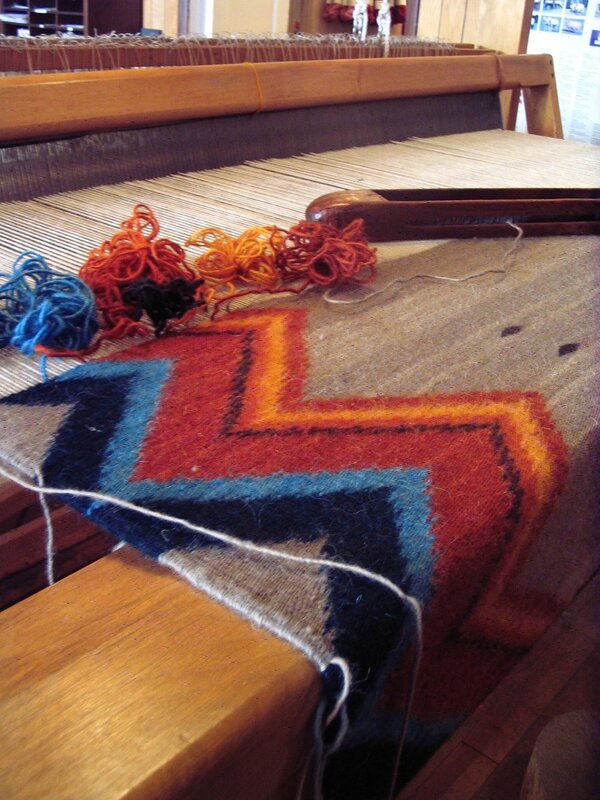 After it comes off the loom, the weaving needs to be “finished.” Finishing the product begins with tying knots to create fringe at either end of the weaving and mending any stray ends. Then, the weaver takes a damp cotton sheet and places it over the weaving, pressing it with a very hot iron until the sheet is dry. Pressing relaxes the wool fibers so that the weaving stays flat. Finally, the fringe is trimmed and the weaving is ready to be graded and put out for sale in the showroom.